February is almost over, and with its exit the beginnings of summer will start to make itself felt. As if we don’t already feel it. We just got back from a short sojourn in a little tropical isle for my brother-in-law’s wedding. The weather was as gorgeous as the bride, charmed and glowing. Little C spent every day of it with sand in her feet and in her hair, skin a shade whiter with all the sunblock her nervous mama slathered on (just like my own mama before me…though in retrospect she seemed a lot less nervous). She went from beach to pool and back again, pausing to eat…a basket of French fries (vacation food) clutched to her chest as she squatted fairly unladylike in front of our resort. The beach is her happy place. This was little H’s first beach trip….and judging by the smile on his impossibly round face (still mostly bald at almost 9 months) the beach may just be his happy place as well. It is a happy place for all of us…a family of beach lovers. There really is nothing quite like the sea and the sand, and the salt water of the ocean that possesses a magical healing quality. Whether it is wakeboarding and kayaking (big C), or floating dreamily on the waves (me), or having a cold beer with sand in your toes while listening to the waves crash on the shore (both of us), the beach is a place we always feel we can never get enough of. And now we are back in the city, sunblock and swimsuits packed away, dreaming of lazy afternoons by the seashore. As is always the case after a long weekend away, work had piled up and we are all rushing around to catch up, with hardly a moment to catch our breath. Here’s something to rustle up if you are likewise as busy! – Rinse and drain the chickpeas well. Place on a tea towel or a double thickness of paper towel are dry as best you can. – Place chickpeas on a baking tray or cookie sheet where they all fit quite loosely in one layer. Drizzle with the olive oil, add the spices, and salt and pepper to taste. Shake the pan back and forth until all the chickpeas are slicked with spiced oil. – Roast in a pre-heated 400F oven for 40-50 minutes or until golden brown, tossing the chickpeas 3-4 times throughout. Just like most things I make, this is quick and easy. So easy in fact that, barring the handling of the oven, a 4-year-old can make this. Click the links in the recipe if you want proof. There are actually loads of versions of roasted chickpeas out there but I just had to share this because it is one of those perfect things that sit at the exact meeting point of ridiculously easy and addictingly delicious. Oh, and it may be healthy too, just saying, not that I am any sort of expert in that department. The chickpeas should be slightly crunchy on the outside but with a bit of softness on the inside, so mind your oven. I like to take mine out at 40 minutes because I like them skirting the side of soft. These are fantastic just by themselves, as a snack, or to serve with drinks instead of nuts. You can also have them on salads, piled on top of a bed of couscous with caramelized onions and garlic yogurt sauce, or stuffed inside a pita with roasted eggplant and peppers and goat cheese. Or a million and one others ways that you can think of. You can also change the spice mix to suit your taste (Mexican, Moroccan, Indian). This smoky paprika and cumin mix is my favorite though. More beach trips are in the works, keeping me going through hectic work weeks and dusty city sidewalks. But whether your bound for the beach or simply home-bound, may you always have something yummy to keep you company! Have a wonderful weekend folks! Wow!!! !how simple you get this recipe!!! I appreciate you for your clear writing. I anticipate testing out a greater portion of your notions. 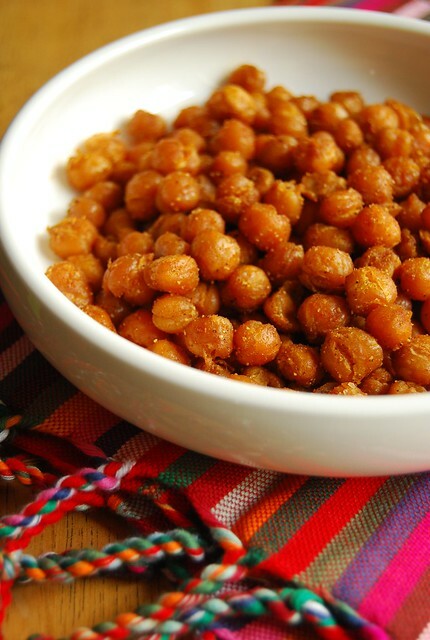 These crunchy chickpeas is a perfect snack while watching NBA games with the guys from home. Hi Jeff! Definitely a great game snack…especially with an ice cold beer!